Get Outdoors. Take a Sensory Hike! Nature is one of the best way to involve your children’s senses. 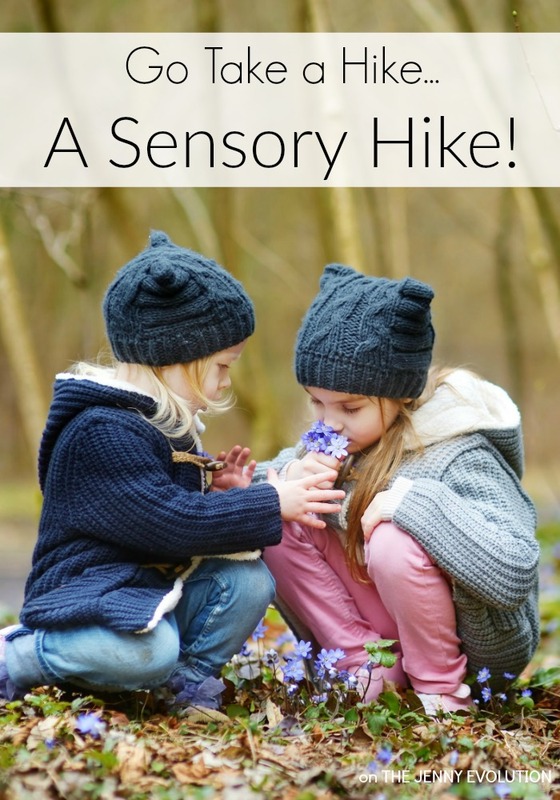 But have you ever thought of specifically taking a sensory hike with your kids? 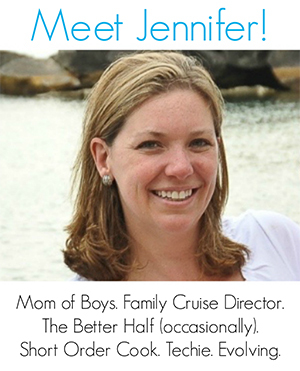 Today, Karen of Spoil My Family shares how she involves all of her children’s senses on an exploratory sensory hike. I love the spring. I live in the Southeastern United States, and it’s just one of the most wonderful, beautiful times of the year. Flowers are everywhere, the world looks and smells amazing, fresh, and reborn! It’s one of my favorite seasons to put your senses to work and to encourage your little ones to do the same! 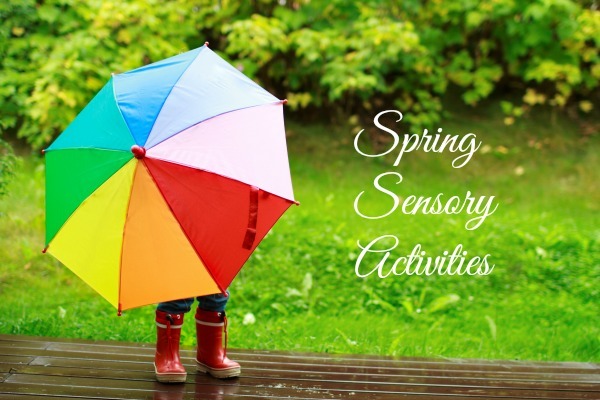 Here is one of my family’s favorite ways to get outside and use our senses, among others! I love the new crisp cool air at the beginning of spring and so we try to get outside at every opportunity. We are lucky that we have so many great hiking areas and trails around us – and we try to take advantage of them. I encourage all of us to put our senses to work as if we were detectives when we’re outside. One of the fun activities that we like is to take a sensory hike. We have each family member pick a sense that they want to use as their primary sense. I have two boys, so one boy may choose his sense of smell; one may choose hearing; one of us may choose sight; and the other may choose proprioception. So we take our walk (you can do this right in your backyard or neighborhood) for about five minutes. Then we each share the story of our walk based upon the sense that we chose. So, my first son may say that he smelled fresh air, and the scent of new leaves on the wind. He smelled the robust smell of the forest floor with soil and moss and decaying leaves. If you children are a little younger or this is new to them, they may just say they smell something “dirty” or “smelly.” That’s a great opportunity to hep them figure out what it is they smell and to give them words to put with the scent. 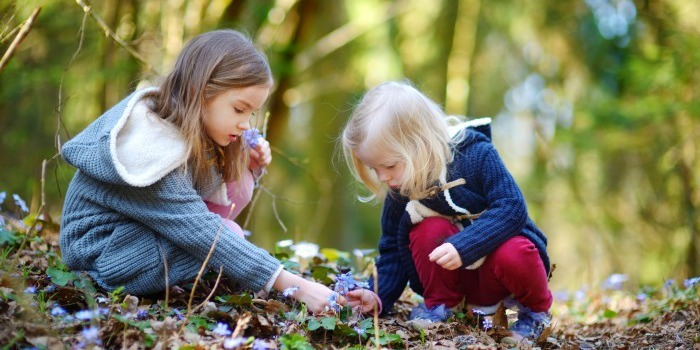 It’s also a great opportunity to let them experience that same thing with their other senses – exploring the the leaves or dirt, for example, with their senses of sight, touch, proprioception – and depending on what it is and your comfort level – maybe taste! My second son may say that he heard the rustle of the new leaves in the trees; the crunch of the dried leaves under his feet and the sound of a bird in the trees. Maybe he heard his brother breathing in deeply… Maybe he heard me digging in the dirt. Many times, they may hear the screech of a hawk hunting high up in the air. We’re bird watchers, so he might also identify it! For proprioception, I may do something unusual like stomp or hop; I may dig or write in the ground with a stick. We may push against or pull on a tree trunk – any number of things can provide proprioceptive input. Descriptions for this may include something like – the tree was hard and firm – it wouldn’t budge! Or, the tree was smooth and small and swayed a little bit when I pushed it. The earth was soft, wet, and sticky, and my stick that I was writing with dug deeply into the ground, or hit a rock and I pushed and dug with my stick until the rock came up. When we perceive the world with all of our senses, each of our senses naturally tunes out things our brain determines are not important. When we focus primarily on one sense, we can perceive much much more! Some children may have difficulty tuning out other senses – and that’s ok! This is a great activity for them to practice focusing on one sense and intentionally choosing the input from one sense as the most important. It’s great practice for all of us! After we play – we usually go to another area and play again or everyone changes up the sense that they selected and we go again! About Karen: Karen’s blog Spoil My Family is all about sharing everything she’s learned over the years – holistic health, recipes, essential oils and raising two beautiful and amazing boys while trying to stay healthy and well amongst the chaos of everyday life. You can read from Karen on Spoil My Family. Spending time out in nature is so good for our kids. It does allow for a special time to involve the senses and practice observational skills. This is a fantastic idea! I love how taking a hike could be used to teach kids about our senses. I will have to do this soon. Thank you for sharing! What a great idea! We hike often and I’m always looking for ways to change it up and make it more fun for the boys. I love this idea. I’m pinning this to my nature board too! Then definitely try this and have fun! It puts such a fun twist on getting out of the house. Look at those darling caps!The hikes sound like such a great idea! Thanks for bringing this by Throwback Thursday last week – Sorry I didn’t get a chance to comment earlier! !